Issues like cavities can quickly cause the quality of your smile to degrade and cause serious issues if left untreated. You can prevent cavities altogether with a simple dental procedure that takes only minutes. Dental sealants can help protect your teeth from decay and keep them healthy and clean for years. Find out more about dental sealants with Dr. David Doyle at Sunnyside Dentistry for Children in Clackamas, OR. Sealants are a preventative dental treatment which creates a layer between teeth which are susceptible to decay, such as molars with deep grooves, and the bacteria and plaque which cause teeth decay. These grooves occur naturally and vary from person to person, making the need for sealants vary from patient to patient as well. Though most often used to protect children’s notoriously decay-prone teeth, sealants can prevent cavities in people of all ages, making them useful in a variety of situations. What can I expect from the procedure for sealants? Sealants are non-invasive and do not require any anesthetic or numbing prior to their placement. The sealing of the teeth involves first applying an etching solution to the tooth to roughen the surface and help bond the sealant to the tooth. The sealant is in liquid form and is simply painted onto the tooth. With the solution in place, your dentist uses a special light to help it harden and set. The entire process takes only a few minutes. 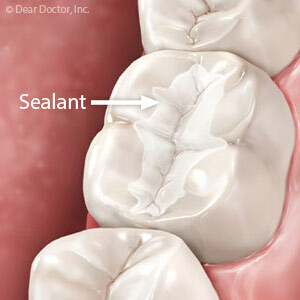 The sealant creates a barrier between the tooth and the elements which cause decay and make the tooth easier to clean. Dental sealants can benefit almost anyone. Properly brushing and flossing is difficult even for adults and some children may not yet have developed their best oral hygiene skills. Sealants are especially important in younger patients since they help significantly lower the chances of decay. In addition to sealants, your child should brush at least twice daily and floss at least once. They should see their dentist at least twice a year for examinations and professional cleanings. For more information on dental sealants, please contact Dr. Doyle at Sunnyside Dentistry for Children in Clackamas, OR. Call (503) 855-5100 to schedule your child’s appointment today!